Resiliency Edge N.I.C.E. problem solvers earn prizes, including $25 American Express gift checks when they turn upset travelers into satisfied customers - and you can too. Vote here for stories you like - and become eligible for $25 American Express gift checks, too. 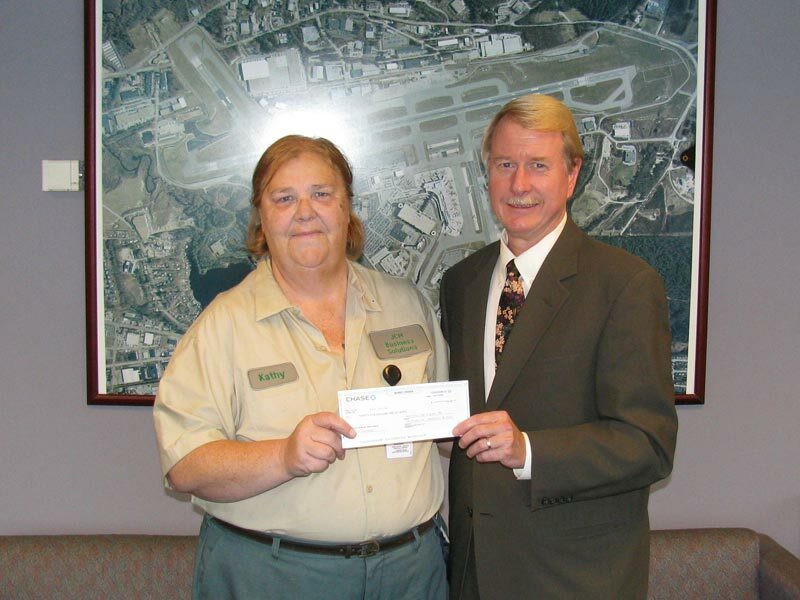 Mark Brewer, Airport Director, presents a gift certificate to this month's "Resiliency Edge" winner, Kathy Sullivan from JCM Business Solutions. I have seen this head set and read up about it quite a bit. I use an iphone and talk quite a bit every day. I think that one of the furaetes that is really great is the ability to connect to multiple sources such as a notebook and phone. I do have a few questions.1) Was this tried with the beta of the 3.0 OS or with 2.2.1?2) Is it possible to select to hear an audiobook or video sound off the headset? (I know this headset does not have A2DP but is it possible to rout sound to this from an iPhone in Mono? )3) Does Battery life live up to the specification sheet?4) Does this headset have flashing lights and if it does can it be turned off?if anyone has answers it would be great. Hello there, just became alert to your blog thgourh Google, and found that it's truly informative. I’m gonna watch out for brussels. I will appreciate if you continue this in future. Numerous people will be benefited from your writing. Cheers! Not just pro action and engagement, but compassion mark Kathy Sullivan's prize winning story this month. Scroll down to Story Number 9 to see how Kathy responded when she came upon a traveler in tears. 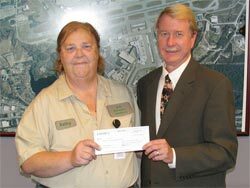 Great story, Kathy - congratulations for being our first Manchester-Boston Regional Airport Monthly Winner! A customer was attempting to return a car to a rental car agency at the airport and did not speak English. The customer was with his family from Mexico and was having a difficult time explaining what was wrong with the car. He wanted to ask the agent some questions. I went over to help translate for the customer and the rental car manager. The customer was put at ease immediately because the lines of communication were now open. I took the time to help the customer and the rental car manager. The customer left happy and was put at ease with the rental car transaction because he and the rental car manager were now able to communicate effectively. Not only was the gentleman happy with the rental car company's resolution to his problem, but he was also elated because I was able to take the time to step in and help him. Kim, Marc and Diane - thank you for taking the time to acknowledge the great service offered by your colleagues. Thank you for taking time to vote! comments: The woman airport employee who stepped in and helped the elderly woman went above and beyond the call of her job to assist. The situation was such that most of us might not have gotten involved to the extent that she did to help. The time she took to assist this passenger and keep her family informed was outstanding. She indeed showed A+ customer service and deserves to be recognized for thinking outside the box! A Job Well Done by this Airport Employee! comments: I can appreciate the help that this person provided because the cancellation certainly disrupted this person’s day/night and not having an avenue to contact the hotel and rental car, the actions from this person must have made this customer’s day. comments: The employee made the passenger\'s day a lot better. The passenger probably would not have been able to get where she was going without a lot of trouble and stress. The employee assisted her beyond her regular duties. An elderly lady was extremely upset with the prospect of flying. I found her in the ladies restroom crying and very upset. I went to her and comforted her, reassuring her that everything would be okay. I found her husband and son waiting for her outside of the ladies restroom and explained her dilemna. They assisted me in making her more more comfortable. The husband and son said, "Thank you so much for helping with my wife/mother. I will send an email to the airport explaining the situation and the kindness and care that you provided." I was happy to have helped out. One of our equipment operators was concerned over their loss of confidence in their ability to perform a specific duty as a result of product changes. I put the employee "in the box" and listened to his concerns without interrupting . I then gathered information from product manufacturers and from the individual. I provided options using all of the information and allowed the individual to implement those options. The employee said, "Thank you for giving my issue attention." A traveler's flight was cancelled and she had no way of contacting her hotel or rental car company to let them know her flight had been cancelled. She was very concerned she might lose her reservations. I took her name and her reservation numbers and contacted the hotel and rental car companies for her. I then paged her in the terminal to pick up the nearest courtesy phone. I then relayed the information to her that here arrangments were updated. She was very happy and she thanked me for helping her out. She said, "I can now relax and enjoy my layover until my flight leaves tomorrow!" 1. Each month during the pilot one problem solver’s story will be chosen at random from among the N.I.C.E. stories posted on the web. •This will apply for stories posted by front line staff and supervisors. So post a story - and you'll be eligible! 2. At the end of the pilot – three months after the training begins – another random drawing will be held at the PILOT AWARD EVENT. A front line staff and supervisor will be chosen from among ALL the stories submitted during the pilot. • There will be awards for the best examples of problem solving – using the program’s four resiliency traits, adaptability, engagement, optimism and pro action – as determined by a panel of airport judges. •A Front line winner will be selected based on the number of N.I.C.E. stories posted during the pilot. •Supervisor winner will be selected by the number of stories (Yellow Forms) the Supervisor submitted for workers. GOOD LUCK! And thank you for using your resiliency strengths to polish the airport’s service image for INTERNAL and EXTERNAL customers! A customer approached me as they had just arrived off a flight. They did not know where to go to get their luggage and they asked me where they should go. I said that I could help them, walked over to the departure/arrival screen and looked for their flight information. I was then able to determine which baggage carousel would be servicing the flight. I directed them to the appropriate baggage carousel. They thanked me for my assistance and said that I had been very helpful. A customer was overcharged and did not receive their travel points/rewards. I verified the customer's rate, applied his travel points and followed through by putting a procedure in place to minimize the chance of a recurrence of the same problem. The customer appreciated my attention and said, "Thank You". A passenger's connecting flight was canceled due to severe weather. There were no more flights to their destination for two days. I remained calm and told the passenger what I could do for them. I looked at alternate airports and was able to provide ground transportation to get them to another airport offering a flight to their destination. The passenger was very thankful that I was able to make it possible for them to get where they needed to go. An elderly lady with a dog and luggage was riding on the elevator and didn't know when to get off or where to go. I kindly asked her what she needed assistance with and she explained that the didn't know where to go. I assisted her through the security checkpoint and to her gate. The passenger was very happy and I left her smiling!